In his thirty-seven years at Indiana State Normal School (ISNS), Francis Marion Stalker made an immense impression on the fields of Education and History. His impact was so great, in fact, that he had a new department created for him and two campus buildings were honored with his name. A native of Bedford, Indiana, Stalker received his A.B. and A.M. from Princeton University in 1884 and 1887, respectively. After having acquired teaching experience at rural schools, high schools, a private academy, and as a superintendent, he became part of the Normal School faculty in 1892. Stalker began his career at ISNS as a Second Associate in the Department of Psychology and Methods. In the summer of 1894, he joined with fellow faculty members Robert G. Gillum and Louis J. Rettger to offer the first summer courses to students. For a fee of ten dollars, students could enroll in two courses spanning five weeks, including Saturday mornings. In 1898, the six-week summer session, which developed out of the original five week session, was made an official term. In addition to furthering students’ education by introducing summer terms, Stalker, along with Charles Madison Curry, created a new professional journal in 1895. The Inland Educator offered a variety of articles concerning the educational process. Contributors’ articles from across the state were edited by Stalker and Curry, an ISNS professor of English. In 1900, the Inland Educator merged with another publication, the Indiana School Journal, to form The Educator-Journal. To have and to keep a sane healthy soul in a sound healthy body; To think straight; To appreciate beauty in nature, in fine arts, and in the deeds of men; To act nobly; To work skillfully with the hands as well as with the head; To realize that there is work to be done in the world; Above all to be consumed with a burning desire to do a full share of the world’s work – These are the marks of a completely educated man or woman. When the original Stalker Hall was demolished in 1952, the Education and Social Studies Building took its place on the same site in 1954. Twelve years later, in 1966, the Indiana State University Board of Trustees renamed the building Stalker Hall, which now houses the Department of History. One may also find his creed prominently displayed in the building’s main lobby, where it continues to inspire members of the Indiana State University community. Indiana State Teacher Association. Advancing the Cause of Education: A History of the Indiana State Teachers Association, 1854-2004. West Lafayette, IN: Purdue University Press, 2004. Francis Stalker Personnel File. Indiana State University Archives. Terre Haute, Indiana. Lynch, William. 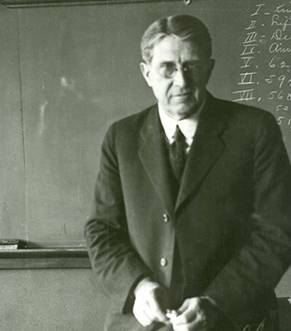 A History of Indiana State Teachers College: Indiana State Normal School 1870-1929. Indianapolis: Book Walter Company, 1946. “Training School 1905.” Indiana State University Archives. 2005. Internet. Available from http://www.indstate.edu/archives/architecture/buildings/training/training school.htm (accessed 5 April 2006). “Stalker Hall 1954.” Indiana State University Archives. 2005. Internet. Available from http://www.indstate.edu/archives/architecture/buildings/stalker/stalker.htm (accessed 5 April 2006). Vancil, David. Interview by Lauren Wenning. 6 Apr 2006. Terre Haute, IN. Written notes.